When it comes to innovation in hair care, industry leaders have long looked to L’Oréal brands like Redken when anticipating the next big thing. It’s no surprise then that the opening of Redken’s new Fifth Avenue retail store in New York City, along with the Redken Exchange training facility for salon owners and professionals one floor above, made waves in the industry. It was the store’s first move in nearly twenty years from its previous spot on 565 Fifth Avenue. Dubbed the Redken Gallerie, it’s also the hair care giant’s new flagship retail location. CrownTV was thrilled to equip both the Gallerie and Exchange with dynamic, vibrant digital displays and a stunning video wall. Redken joins a large and growing number of beauty businesses served by CrownTV and its French parent company, Crown Heights. “Redken has always been at the forefront of the industry’s latest techniques and technology and the Redken Gallerie and Exchange are no exception,” said Sheri Doss, VP of Education at Redken Worldwide. 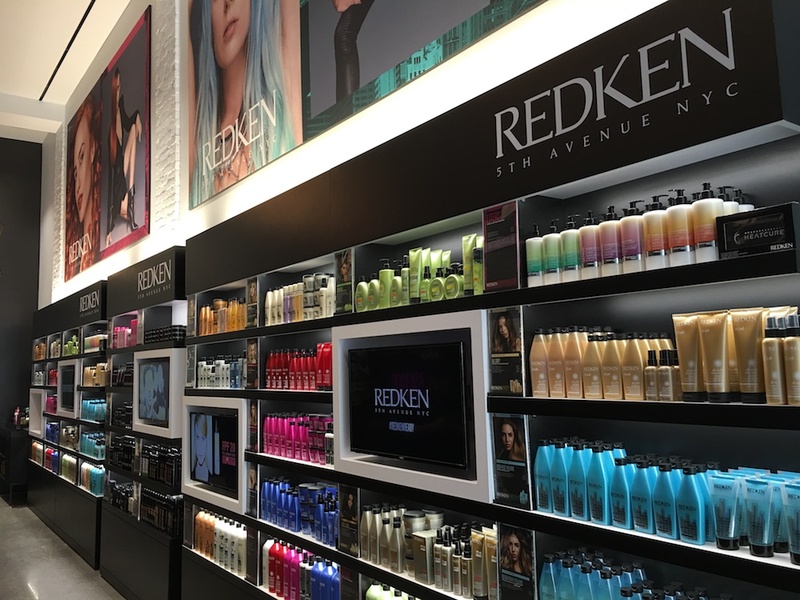 Redken sells hundreds of different products in a single retail store. Browsing them all and finding the right one can be overwhelming. How is a shopper to navigate such an extensive inventory? 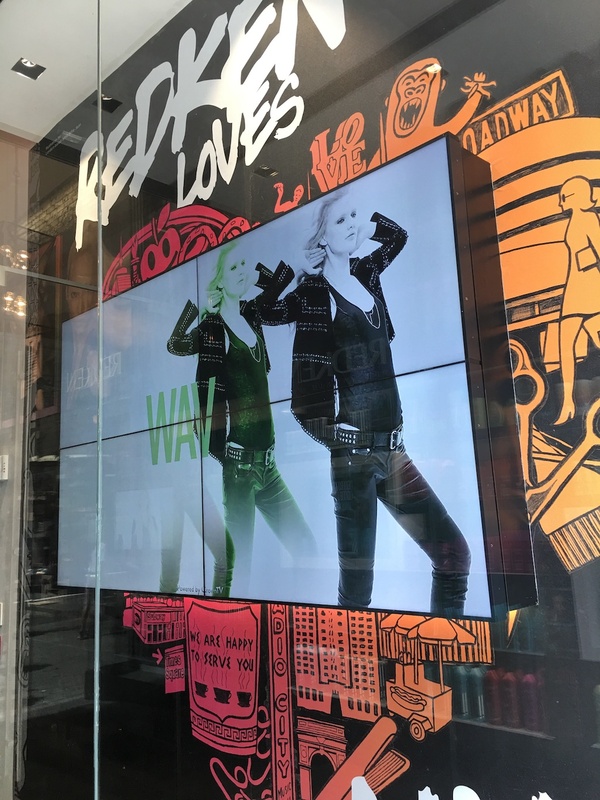 Redken’s previous Fifth Avenue location was also equipped with CrownTV digital signage, but the store was not using the technology to its fullest potential. The content on the screens added plenty of branding and allure to the space, but didn’t do much in the way of helping shoppers find what they were looking for or discover products they may want to try. When Redken opened its new Gallerie store, they wanted this to change, and CrownTV had just the right solution. CrownTV tackled the challenge by placing displays and allocating content in a more strategic manner. In doing these things, we created a space optimized for product marketing and easy browsing. For instance, a screen clearly labeled “What’s New?” draws shoppers’ attention to a line of products called Heatcure. The screen’s content provides detailed information about the products, such as what they do, the hair type they’re intended for, how to use them and even demonstration videos. A similar example is the “Must-Haves” section, where Redken uses a screen to promote products that aren’t necessarily new but are worthy of special showcasing. This designated product area is also prominently labeled and easily noticeable. With these dedicated screens in place, a shopper seeking to learn about and potentially purchase the latest and greatest Redken products knows exactly where to look in the store. CrownTV also placed screens within the Gallerie’s retail shelving, where shoppers will inevitably see them as they peruse products. These screens are beautifully built into the shelves, appearing as a native component of the store. The previous Redken Fifth Avenue store did not have screens among its shelving, leading to a huge missed opportunity to fit in more branding and product marketing. In addition to promotional content, these shelving screens display content with a broader focus, like Redken fashion shows, interviews with stylists or behind-the-scenes footage. Interwoven with this content are branded videos containing Redken’s signature logo, colors, fonts and slogans. Such content, and so strategically located, immerses the audience in the Redken brand as they shop in a way that will stick in their minds. Being a store heavily frequented by salon and hair care industry professionals, the Gallerie’s digital signage provides a great example of how the industry can stay technologically and aesthetically modern. The displays solidify Redken’s leadership in the realm of beauty industry technology, conveying a cutting-edge look and feel to the store that is all-encompassing. The largest installation, a video wall at the entrance to the Gallerie, is a powerful tool for attracting foot traffic and making a lasting first impression. 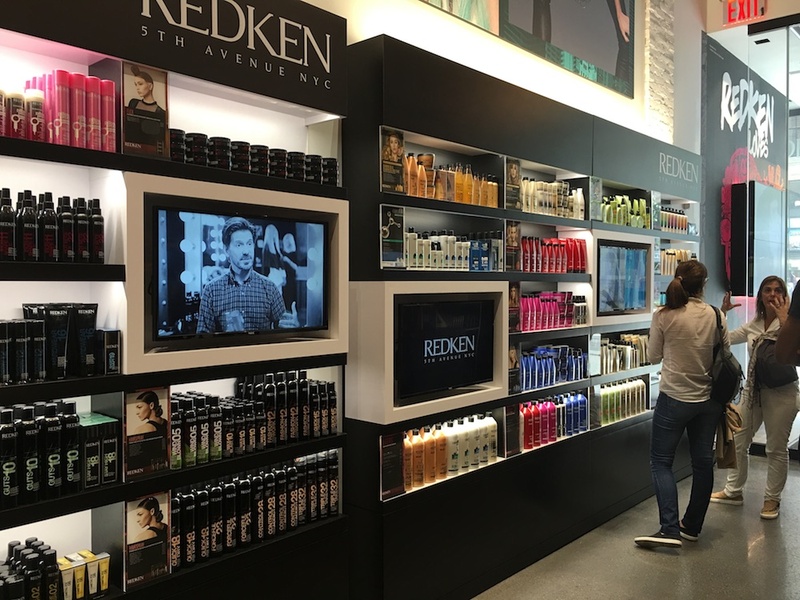 Redken uses the video wall primarily with the goal of drawing customers into the store in one of Manhattan’s most popular shopping destinations. CrownTV also equipped the Redken Exchange with one screen behind the reception desk. 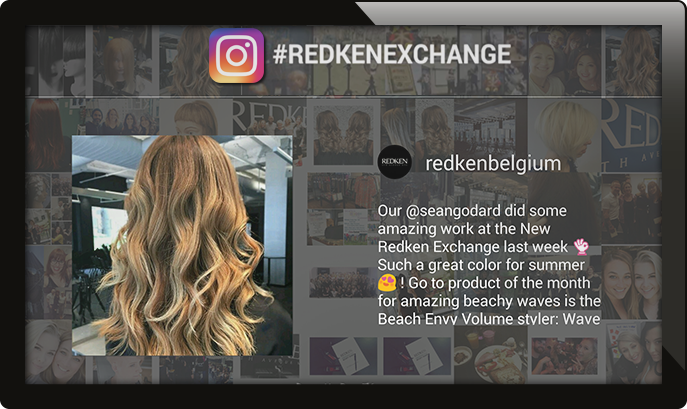 Instead of promoting products, this screen shows off Redken’s social media buzz by featuring an Instagram feed of posts mentioning #theredkenexchange. In addition, the screen plays a video of Exchange trainees exhibiting what they’ve learned at a fashion show. When it comes to operating experience, things couldn’t be more seamless for the Redken employees working in the Gallerie and Exchange. The technology is highly automated, allowing users to quite literally “set it and forget it.” They often let a series of videos run in rotation, but if they ever wish to switch up the content, logging into their CrownTV dashboard and making a few clicks are all that’s necessary. As always, this can be done remotely on any internet-connected device. Redken’s Fifth Avenue retail store didn’t just move, it got a makeover. They look forward to using the screens to inspire customers and give them the best hair of their life – because they’re worth it. Like what you’ve read? Let’s talk more about how digital signage can transform the customer experience, look and feel of your retail store – or other business. Request a demo of CrownTV’s digital signage solution today.